These three incredible stocks shouldn't disappoint you if you're a risk-averse investor. There's no such thing as a riskless investment, especially when it comes to stocks. You can, however, mitigate the risks associated by opting for "low risk" stocks, which, in my opinion, typically belong to companies with strong competitive advantages, rock-solid balance sheets, and a prudent management team that can steer the company just as well through downs as ups to generate strong shareholder returns year after year. Such companies also usually pay steady dividends, further adding to their appeal. Think 3M (NYSE:MMM), Stanley Black & Decker (NYSE:SWK), and Brookfield Infrastructure Partners (NYSE:BIP) -- all three are great stocks that would fit any risk-averse investor's portfolio. If you've ever used hand and power tools to repair your home or car, you've probably heard of Stanley Black & Decker. What started as a bolts and hinges company in 1843 is among the world's leading diversified industrial machinery manufacturers today and has built a brand that's hard to replicate. Stanley, DeWalt, Black & Decker, Proto, and Porter Cable are just some of the brands owned by the industrial house. More recently, the company added Lenox, Irwin Tools, and Craftsman brands to its portfolio via acquisitions. It hasn't been an easy ride for Stanley, but the company has played its moves well by mixing organic with inorganic growth, leaving little room to complain. Most importantly, Stanley is one of the best dividend stocks in the industrials sector, having increased its dividend for 50 consecutive years. There's one big reason for this: Stanley is more a defensive industrial company than a cyclical one, given that the tools it manufactures are used widely for essential services such as repairs and security. That's also why I consider Stanley to be a low-risk stock. If you're wondering whether you should invest in Stanley right now, the company's long-term financial goals should help you decide. They include 10% to 12% growth in revenue and earnings per share each and 100% or more conversion of net income into free cash flow (FCF). That should give you enough reason to trust this stock with your money. Stanley and 3M have a lot in common. Both manufacture ubiquitous products, own world-renowned household brands, fall on the defensive side of industrials, boast solid operational and financial track records, and are Dividend Aristocrats. 3M may not ring a bell until I tell you it manufactures Post-it notes and Scotch tapes. In fact, 3M is much more than that, with a portfolio comprised of more than 60,000 products that serve the needs of diverse industries, including industrial, consumer, healthcare, electronics, and energy, among others. On the operational and financial fronts, 3M has an impeccable track record. It was no different in 2017: 3M sales grew 9.6% and generated free cash flow above net income, thanks to robust performance from each of its five business segments. 3M's also unlocking value from its recent $2 billion acquisition of Scott Safety from Johnson Controls even as it continues to divest low-margin businesses in areas such as communication markets. Much like Stanley, the biggest evidence of 3M's resilience and strength is its dividend track record. Heck, it's even better than Stanley's: Last year, 3M increased its dividend for the 60th consecutive year, and it was a 16% hike. 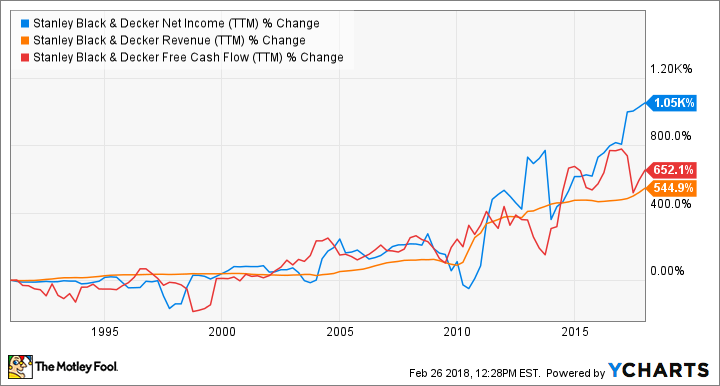 I am very bullish about 3M and believe it will continue to earn shareholders rich returns for years, just like it has in the past, backed by strong growth in earnings and cash flows. For perspective, if you'd invested $10,000 in 3M shares 10 years ago and reinvested its dividends all along, your money would've grown to nearly $38,500 by now. Did 3M's past performance shock you? The future could be great as well! Image source: Getty Images. OK, now what if I tell you about a stock that has more than quadrupled in the past decade, offers a dividend yield of 4.5%, and aims to generate consistent double-digit returns on equity in the long run? Read along. By now, you've got a hunch that I like defensive stocks when it comes to weighing returns against risks. Brookfield Infrastructure Partners is another interesting defensive play that has what it takes to earn you solid money for years. Brookfield is one of the largest infrastructure asset companies in the world with high stakes in utilities, transport, energy, and communications infrastructure sectors. So power transmission lines, toll roads, gas pipelines railroads, and telecom towers are just some of the kinds of assets the company owns. Brookfield stands out because of its business strategy though -- it acquires distressed assets, turns them into cash-making machines, and resells them opportunistically to invest in other assets. To give you an example, Brookfield took a big leap into utilities last year when it acquired a natural-gas pipeline worth $5.2 billion from Brazil-based oil major Petrobas, which sold it to raise money to deleverage. Brookfield has proved its mettle so far, having grown its funds from operations at a compounded average clip of 21% and dividends by 12% since inception in 2008. When you factor in Brookfield's plans to grow its dividends annually by 5% to 9% in the long run backed by calculated investments in its portfolio, you can be hopeful this stock's returns will outweigh its risks.